California Declares State Of Emergency Over Months-Long Gas Leak : The Two-Way Since October, a natural gas storage well near Los Angeles has been spewing hundreds of tons of methane gas each day. The leak isn't expected to be fixed for months. 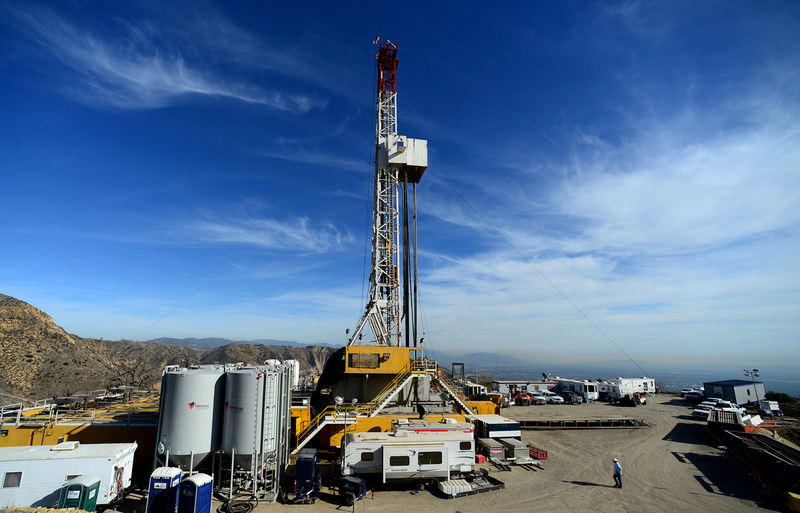 Crews work on a relief well at the Aliso Canyon facility above the Porter Ranch area of Los Angeles in early December. A leak has allowed tons of methane to escape into the surrounding neighborhood; stopping it is taking months because of pressure from the leak. Gov. Jerry Brown has declared the state of emergency based in part on the "prolonged and continuing" nature of the massive blowout, he said in a statement. Brown has ordered the Southern California Gas Co. to identify a backup plan for stopping the leak if the current strategy — drilling relief wells, then filling the leak with mud and cement — doesn't work. He promised that the state will ensure the gas company covers all the costs of addressing the leak, without passing the expense on to consumers. The governor is also initiating emergency regulations at gas storage facilities across the state, including regular inspection and testing and ongoing measurement of the gas flow within wells. Residents have complained of headaches, nosebleeds and nausea, and two nearby elementary schools have shut down. SoCal Gas is being sued for not quickly informing nearby residents about the leak. Two weeks ago, Ingrid Lobet reported for NPR on how the leak was affecting local families — and why it's so hard to shut down. The leak isn't tidy, an expert explained to Lobet: The escaping gas can't simply be siphoned off. And as the Los Angeles Times detailed earlier this week, the pressure of the escaping gas makes it impossible to stop the leak by filling the well from the top. A methane leak of this scale appears to be without precedent, representatives of both an environmental group and the gas company told Lobet.